Intensity: Unless you happen to be someone with joint problems, you are going to need more impact in your daily life to keep your body strong. Treadmills enable workouts that are way more intense than anything an elliptical can offer. Moreover, workout techniques like HIIT can add more flare to treadmill work out and make them all the more effective while also preventing muscle loss. Variety: There’s more diversity to the kind of workouts you can do on the treadmill. You can do lunges, you can run on it, you can increase the incline. This can help you switch things up and try a variety of different exercises with the same machine. More Effective: Treadmills enable sport-specific training for charity runs, races or anyone who’s looking to get into effective exercises that will yield quick results. Can be boring: It can be daunting to just keep running on the treadmill for hours. While you can switch things up with the help of music or anything else that keeps you distracted, the treadmill still happens to be relatively more boring to get through. Safety: Safety is a considerable issue with treadmills as there’s always the risk of someone falling or tripping off the running belt. 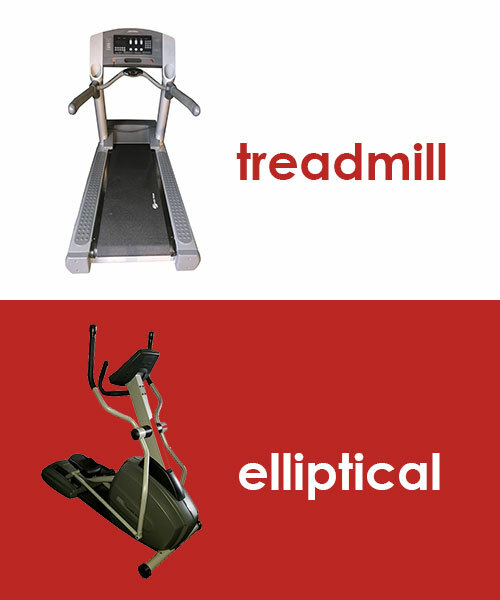 Expense: Treadmills are usually more expensive than ellipticals. If you’re looking to buy one for home use rather than just using at the gym, the treadmill is going to be heavier on the pocket than the elliptical. However, you can also find used options through companies such as AES Fitness. Low-Impact Workout: This is a pro for many people who are looking to lose weight while also tending to their joint problems. The elliptical is a less stressful workout for your body and can prevent joint pain or problems. A Holistic Body Workout: If you use the arm handles along with the pedals, you’re working out your whole body with the elliptical. This is something the treadmill doesn’t offer. Ease: Being a lower intensity workout, the elliptical can be an easy movement to get accustomed to and hence can ensure its longevity in your workouts. Numb Feet: Elliptical workouts don’t require you to lift your feet up for the most part and can hence lead to numb feet that make your workout even more difficult. Less Intensive If you’re looking to lose as much weight as quickly as possible, the elliptical is not going to be as intensive as you’d want your workout to be. While the ultimate decision obviously rests within you – unless you happen to have joint problems or can’t engage in intensive workouts – the treadmill can prove to be a much more effective choice than an elliptical. Either way, good luck with achieving your fitness goals.